The Quad Cities River Bandits scored a season-high 11 runs as they extended their winning streak to 10 games with a home win over the Wisconsin Timber Rattlers on Friday. The 11-6 victory improved QC’s record to 23-6, the best in affiliated baseball. They have a 5 1/2-game lead over the Cedar Rapids Kernels (17-11) in the Midwest League Western Division. The Timber Rattlers have an eight-game losing streak and the worst record in the league (8-21). 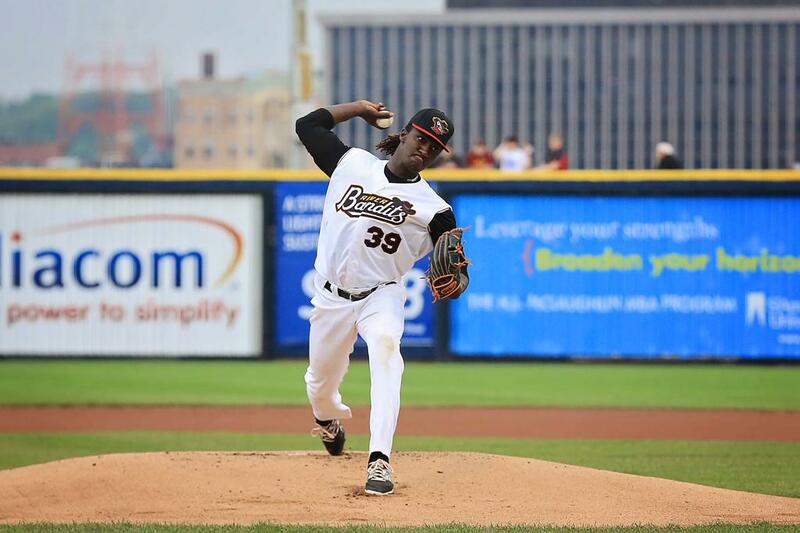 River Bandits starting pitcher Akeem Bostick looked sharp in his Midwest League debut, holding the Timber Rattlers to one hit in five scoreless innings. He struck out one and hit two batters (actually the same player, Dustin DeMuth, twice). The River Bandits scored four runs in the 1st inning, two runs in the 5th, and five runs in the 8th. The Timber Rattlers got to the QC bullpen, scoring three runs each in the 8th and 9th innings. DeMuth and Brandon Diaz homered for the Timber Rattlers. Ryan Bottger drove in three runs and Bobby Boyd had three hits, a stolen base and a run batted in for the River Bandits. QC’s winning streak is its longest since taking 10 in a row from April 26 to May 7, 2002. The 2002 team featured nine future major-leaguers, including Minnesota Twins first baseman Joe Mauer. Current Kernels manager Jake Mauer (Joe’s older brother) also played on that team. This entry was posted in Cedar Rapids Kernels, Midwest League, Quad Cities River Bandits, Wisconsin Timber Rattlers. Bookmark the permalink.